The role of Basilio on 18th of May will be performed by Ilgiz Galimullin due to physical condition of Kojima Naoya. Please also refer to New National Theatre News. Available from Sunday 10 February, 2002 at 10:00 am. 50% discount is available for foreign tourists purchasing on the performance day. Please show your passports at the Box Office. Based on Cervantes's famous novel Don Quixote, this ballet was premiered to the choreography of Petipa at Moscow's Bolshoi Theater in 1869. The cheerful story set in the sun-kissed southern country of Spain and the storyline featuring a succession of accentuated folk dances by dancers in colorful costume were well received, and the ballet has continuously been performed and has won applause to the present day though its first version underwent several subsequent revisions. 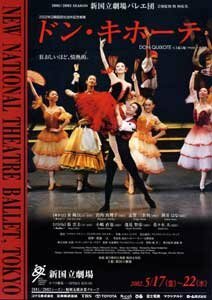 In March 1999, the New National Theatre, Tokyo invited Alexei Fadeyechev, former artistic director of the Bolshoi Ballet, and produced its first performance of Don Quixote based on his newly revised version. This production faithfully followed Petipa's spirit and yet developed the story in a tempo befitting the present age. It filled the broad space of the Opera House with gaiety, enjoying highly favorable reception from the audience. In the forthcoming production, the NNTT's third, Kim Joo-wong and Jang Un-kyu, up-and-coming dancers invited from the Korea National Ballet, will appear as principals in commemoration of the co-sponsorship of the World Cup soccer championship to be held in Japan and Korea this year. Through ballet, a physical art that requires no language, this will achieve a gorgeous and lively cultural exchange between the two countries. Enjoy the magnificent program that costars the Korean dancers and three pairs of outstanding Japanese dancers. The setting is a small, antiquated inn in the region of La Mancha, Spain. An elderly gentleman, who has had his mind confused by reading too many stories of chivalry and fancies himself to be a knight, calls himself Don Quixote and embarks on a journey with the peasant Sancho Panza as his servant. An event occurs in the port town of Barcelona when they arrive there. Kitri, a daughter of the innkeeper Lorenzo, is the prime favorite with the town. Although she is in love with the barber Basilio, her father stubbornly does not allow her daughter to marry Basilio because he wants her to marry the rich nobleman Gamache. Kitri, however, hates the foppish Gamache. The love affair over Kitri involves even Don Quixote as the image of Kitri overlaps that of his ideal woman Dulcinea. What should Basilio, the choice of Kitri's heart, do? The whole town is interested to know how things will develop and is thrown into commotion. How will the love affair come to an end?